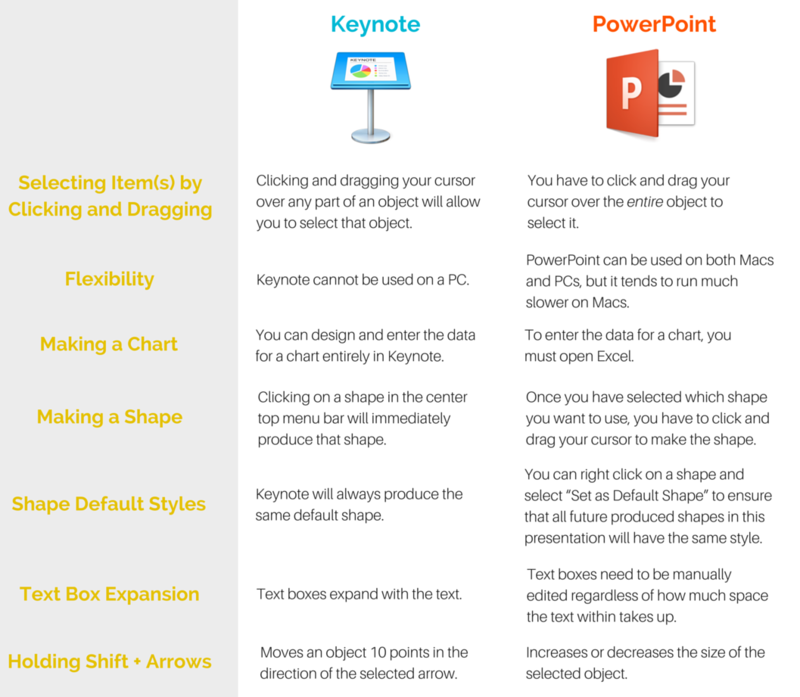 Keynote vs. PowerPoint: Is There Any Real Difference? In business communication, the presentation is huge. Decisions are made, proposals are won, and shifts in processes are created on the strength of thoughtful presentations. Here’s my look at two of today’s biggest presentation tools: Microsoft PowerPoint vs Apple Keynote. Meanwhile, just about everyone has heard of Apple's Keynote—but usually they haven’t worked with it, and probably can’t say what makes it different than PowerPoint. Is Keynote Better than PowerPoint? When I sat down to write this blog, I was intent on explaining the multitude of reasons why Keynote is superior to PowerPoint. In trying to form those reasons, however, I found myself stuck. I’ve been enthusiastically using Keynote to craft presentations and proposals for the past 6 months, and because this enthusiasm was never present when I worked in PowerPoint, I came to the conclusion that it was because PowerPoint is somehow worse than Keynote. The tricky part here is that PowerPoint and Keynote really aren’t all that different. When I booted up PowerPoint looking for problems, I found few of note. I wanted to say that it was worse because of its clunky interface, but that’s subjective. I wanted to write about how its pre-made templates limit creativity, but the same could be said for Keynote templates. Ultimately, the two programs offer mostly the same features and functionalities; they merely organize them differently. This is not to say that it is impossible or irrational to prefer one to the other. There are still noticeable differences between PowerPoint and Keynote that could provoke someone to use one over the other. Select the “Arrange” tab under Format. Right click on the object. Select “Position” on the left hand column of the popup. Sure, that’s a one-step difference, but the addition of the popup window in PowerPoint can often take you away from the context of your shape, meaning that you have to move the popup window around in order to see what you’re actually moving. Whether or not these differences are significant is up to you. Ultimately, I prefer Keynote because of its slick interface and improved performance on a Mac, as well as for some of the reasons listed above, but I can see why some may prefer PowerPoint—especially if they’ve been using Microsoft Office products their entire life. The best way to determine which is best for you is simply to play around with the features in each program and see which better suits your needs and style. Once you get past the decision-making process, the sky’s the limit.